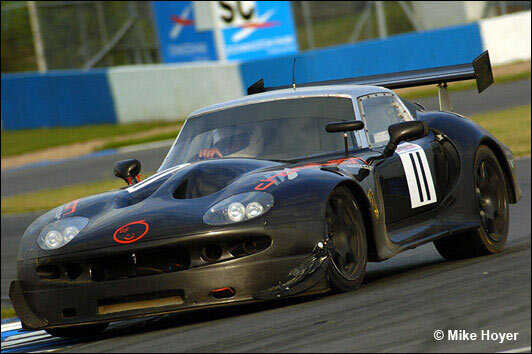 British GT competitors Ian Flux and Kevin Riley, in the Rollcentre Mosler MT900R, came to Britcar, saw, and conquered in the 100-minute race at Donington on Saturday. Riley’s opening stint was marred by handling problems and a minor clash, but he recovered to hand the car in a good position to Fluxie, who set a string of fastest laps as he claimed and substantiated the lead. 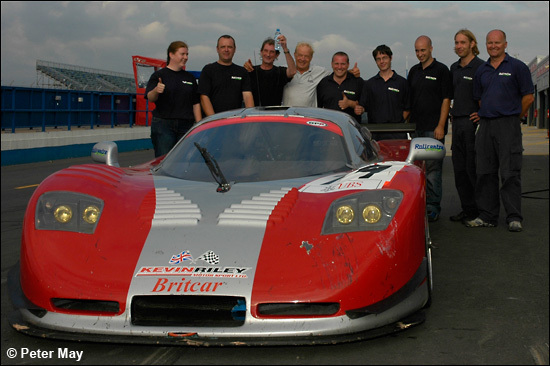 None of these elements are strangers to Britcar of course; Flux and Riley have drifted in and out of the series, both singularly and together, and a Rollcentre Mosler was the winner of the inaugural Britcar 24 Hours last year, but what was this weekend’s story? Pole position was the preserve of the Porsche 935 Replica of Richard Chamberlain and John Allen, revelling on a revised Dunlop mix, with the tyremakers logo writ large and proud on the sidewall. Chamberlain’s time of 1:09.741 was just 0.166 quicker than Flux in the Mosler, who was in turn nearly three seconds faster than third-placed Phil Bennett, wringing the neck of Nigel Mustill’s Opel V8Star – on an oily track. 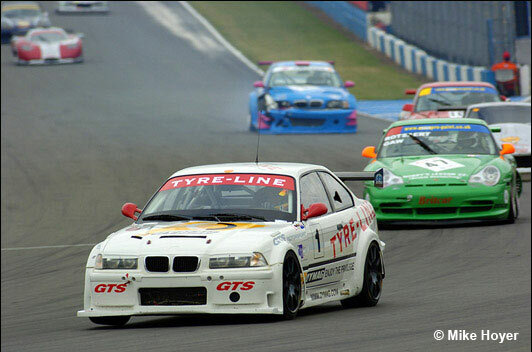 The Harry Handkammer / David Leslie BMW M3 was next, followed by fellow GT Cup class contestants Willie Moore and Dave Cox, in their newer E46 M3. 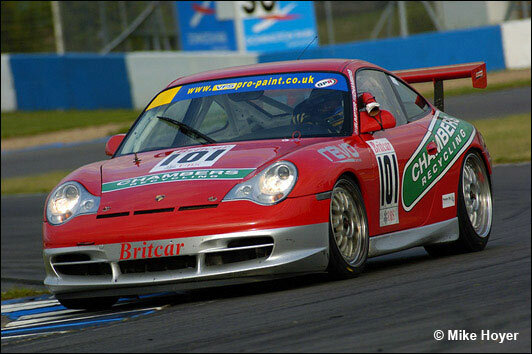 Pete Chambers’ red and silver Eurotech Porsche GT3 has been a familiar site in a number of GT and one-make series for several years, and with Mark Sumpter sharing the driving, the car lined-up sixth on the grid, heading the GT3 runners, which significantly included the Ferrari 360 of Bo McCormick and Calum Lockie in seventh. 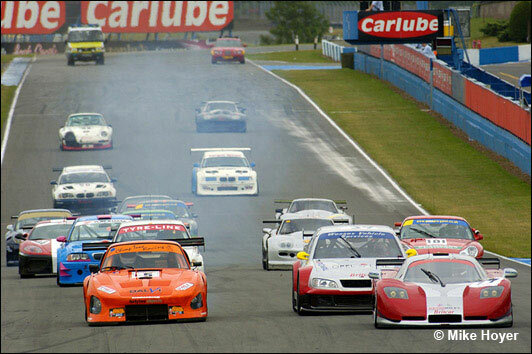 Mick Mercer had used the V8 Supercars races as a running-in exercise in the Topcats Marcos Mantis, and, partnered by Hyperion boss Richard Fores, was eighth. 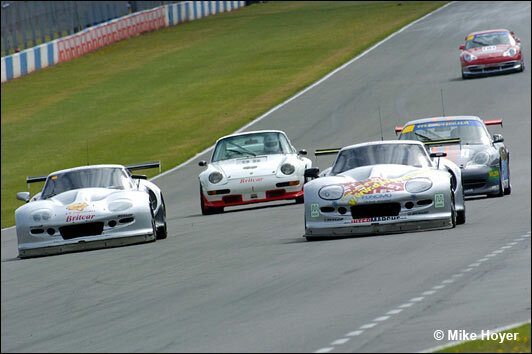 It was an all-Porsche fifth row, the “Nobby’s Crisps” ex-Supercup machine of Jean-Marc Rotsaert and ex-Clio and Caterham ace John Gaw alongside the 911virgin.com car of Henry Firman and Pete Morris. Colin Wilmott has risen from one-make MG racing this year, at Spa in a BMW M3, and now in a Porsche 996, quickly got to grips with the machine, lining up 11th. 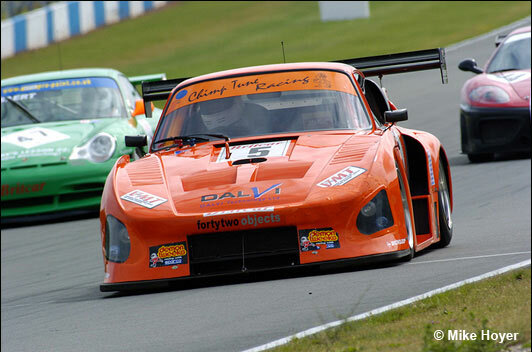 Next up was the second Topcats Marcos, driven by Luc Paillard and Gilles Vannelet. “They only speak French, so we don’t know what their plan is, who’s starting, when they’re stopping – we’ll just let them run their own race,” joked team boss Warren Gilbert. Peter Cook and Franck Pelle qualified their older Porsche 911 13th, but failed to take the grid, leaving the Damax Ferrari 360 of David Back and Andy Ruhan alone on row 7, and it was bad luck too for Simon Leighton and John Taylor, whose Porsche GT3 suffered clutch problems after qualifying 15th. 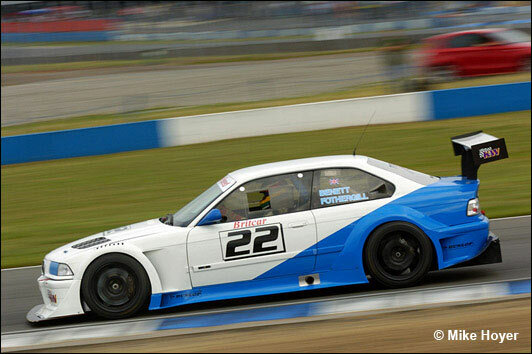 The Torquespeed V8 BMW M3 of Dave Benett / Marcus Fothergill was next, then George Agyeton’s self-built BMW M3, being shared with Mark Smith. The Bilmo BMW M3 of Peter Hardman and Nick Leventis was withdrawn after an off during qualifying, leaving the back row to Paul Livesey / Brian Robinson Porsche 911, and the rebuilt Marcos Mantis of Alun Edwards and Jerry Hampshire. 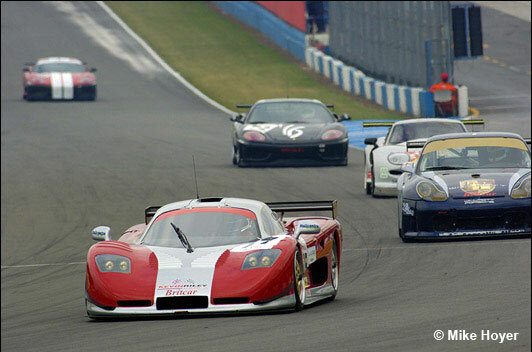 It was nearly a quarter-past five when the Britcar field was finally let loose, and Riley, in the Mosler, seized the initiative into Redgate, ahead of Bennett’s Opel. The action at the front was hard and fast, though, and Riley spun – or was he tapped? – as they entered Coppice, and it was Bennett who led as they chalked up the first lap, followed by John Allen’s monster Porsche, Handkammer’s BMW (below), the amazing John Gaw (up to fourth from ninth on the grid), Mercer, Chambers, Morris, then the recovering Riley. Dave Cox brought the Moore International BMW into the pits with front-end damage. He would rejoin after some attention, but retire after 19 laps. The charging Gaw in #47 relieved Handkammer of third place on lap three, and then dispensed with Allen next time round, though it appeared that the orange Porsche could have a problem, laying a trail of thick grey smoke in the braking zones, which hung around in a pall over the corners. By lap eight, Allen brought the car in for a prolonged investigation, and after a further exploratory lap, it was retired. Phil Bennett was eking out a comfortable lead at the front, now nearly 18 seconds to the good ahead of Riley, who had made short work of climbing back through the field, while Mick Mercer’s Marcos Mantis spun at Redgate, after a storming performance in the opening laps. Undeterred, Mercer pulled it together, mounting a charge back, though under pressure from Pete Morris’s Porsche, which was the meat in a Marcos sandwich, as Vannelet in the second Topcats Mantis was hard on his tail. 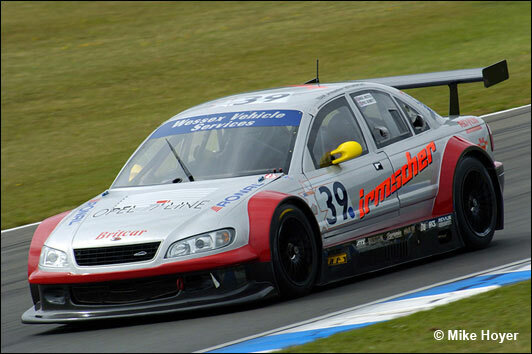 This was short-lived, sadly, for Mercer, and with his Mantis smoking it was pitbound, to retire after just 23 laps. Pete Chambers had been closing in on Gaw, who appeared to be slipping slightly after his initial charge, and once Chambers was past into fourth, Gaw became fair game for Pete Morris, closing in at nearly two seconds per lap. Again, this was short-lived, for smoke billowed from the rear of the 911virgin.com car as it crossed the line, followed by a small burst of flame, and Morris brought the car safely to a halt down the hill from Redgate. “It was a broken oil line, the engine’s OK. It wasn’t as bad as it looked,” said the Tamworth construction magnate later. Bo McCormick had been pacing himself as usual, and, now in seventh place, and with 60 of the 100 minutes race duration to run, pitted to hand the Ferrari 360 to Calum Lockie. Riley, from second, and three-quarters of a minute adrift from leader Bennett, came in too, Ian Flux taking over the Mosler. John Gaw had got second wind, for he had now got back onto terms with Chambers, and once past, began to pull away. Chambers was soon pitbound though, it now being around the half-way mark, though Phil Bennett stayed out, consolidating his lead, as did Gaw, now in second place. Flux was now flying, two laps down on Bennett, but rapidly seizing one of them back as Bennett offered little resistance, and with 50 laps on the board, and 39 minutes to go, the silver Opel V8Star was in the pits, and owner Nigel Mustill installed behind the wheel. Gaw left it a little longer, with just 36 minutes left on the clock, before handing the Porsche to Jean-Marc Rotsaert. With the stops all taken, the race was back on an even keel, revealing Mustill’s Opel still in the lead, but now just 38 seconds in front of the Mosler, with Flux bringing the lap times lower with every tour. Barring dramas, the Mosler taking the lead was inevitable, and by lap 60, Fluxie was in a position to make his move, for which he bided his time, selected his moment, and conducted in a gentlemanly fashion, under the Dunlop bridge and through the chicane. It was bad news for the Topcats team, for, with the Mercer / Fores Marcos already out, Luc Paillard brought the #4 car smokily into the pits to retire with just 15 minutes to go. Misfortune also hit the Eurotech Porsche, for Mark Sumpter brought the car in on the very last lap with a puncture, relinquishing fourth overall, and more importantly, the GT3 Class victory to the Bo McCormick / Calum Lockie Ferrari. 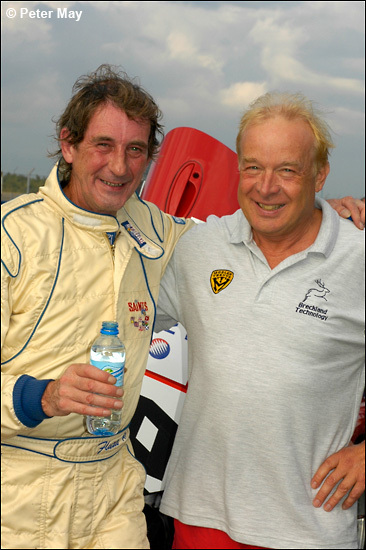 Phil Bennett had excelled in Nigel Mustill’s Opel. Nigel has been developing the car, and lately it has been showing signs of worrying the front-runners, but Bennett had raised it to another level, showing his true class. Harry Handkammer and David Leslie used all of their endurance nous, and punched well above their weight to finish third overall, and claim the GT Cup win, in the GTS Motorsport BMW. Behind the GT3 leaders (McCormick / Lockie and Chambers / Sumpter), Jean-Marc Rotsaert and John Gaw claimed the GTC runners-up prize. The phenomenal Gaw had done the lion’s share of the driving before handing over to a more cautious Rotsaert. 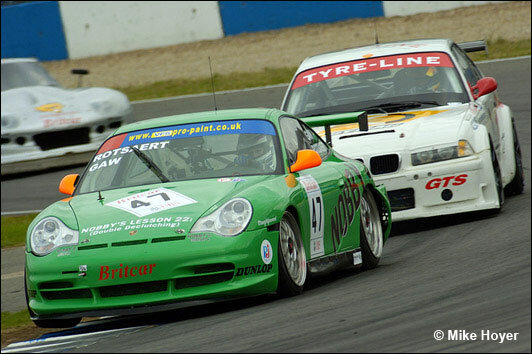 Paul Livesey and Brian Robinson came home third in the GT3RS class in the their older Porsche 911, the 996 being saved for the upcoming 24 hours. 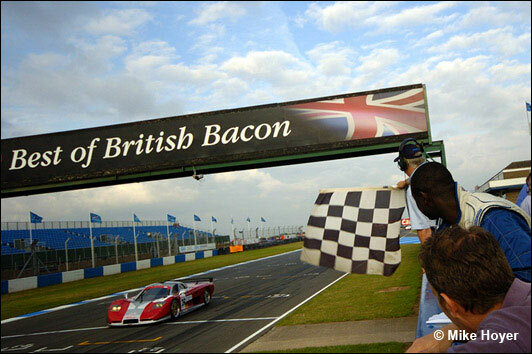 David Back and Andy Ruhan – affectionately dubbed “Rack and Ruin” by Melindi Scott – had enjoyed an in-out, on-off relationship with the pits, the grass, and the gravel in the Damax Ferrari 360, but had done enough to bag the final podium spot in the GT3 class. Just missing out, and similarly plagued by pit-stops and spins, was the Torquespeed BMW of Dave Benett and Marcus Fothergill. 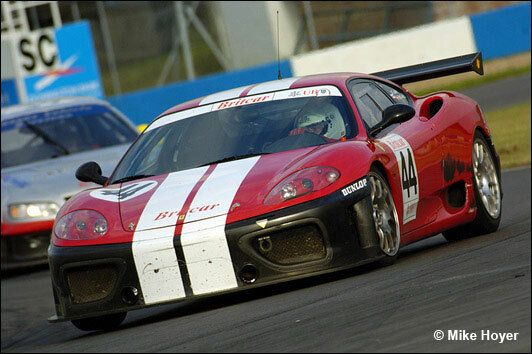 Third in GT Cup was old campaigner George Agyeton, just desserts for him and Britcar regular Mark Smith in the E46 BMW, and fourth in GT Cup, and the last classified finisher, was the #11 ISL Marcos Mantis of Alun Edwards and Jerry Hampshire.